Special considerations need to be made when planning cabinetry for the BEST room in your home… the room directly outside the back door! During the planning phase let us help navigate all the variables and help you select the right product and configuration for your outdoor cabinetry project. 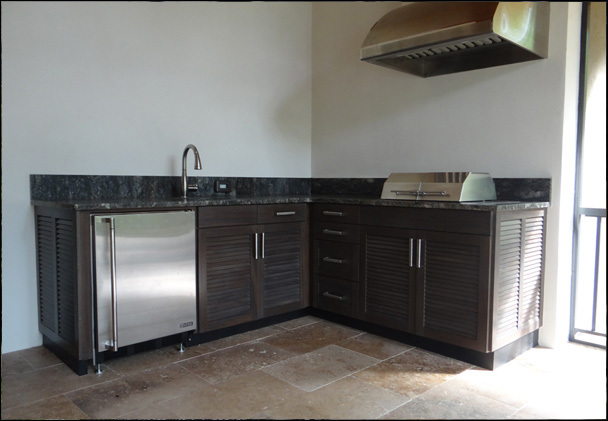 We offer custom cabinetry construction with state of the art materials and finishes appropriate to use outside. We are committed to quality and meeting your expectations and complete satisfaction. Our manufacterers specialize in outdoor projects and working with the elemnets every day. Other custom considerations include appliance needs, cushion storage, TV cabinetry with locked doors, hanging BBQ tool pull outs, screening behind louvered doors, stainless shelf stiffeners, stainless hardware selection, surface options and samples at our showroom. We are determined to tackle and conquer the challenge of working in the great outdoors … in your backyard!